Will the Colbys best the Carringtons during the second season of the Dynasty TV show on The CW? As we all know, the Nielsen ratings typically play a big role in determining whether a TV show like Dynasty is cancelled or renewed for season three. Unfortunately, most of us do not live in Nielsen households. Because many viewers feel frustration when their viewing habits and opinions aren’t considered, we’d like to offer you the chance to rate all the Dynasty season two episodes. **Status update below. A CW reboot of the classic 1980s primetime soap, Dynasty stars Grant Show, Alan Dale, Elizabeth Gillies, James Mackay, Sam Adegoke, Robert Christopher Riley, Rafael de la Fuente, Ana Brenda Contreras, Maddison Brown, and Nicollette Sheridan. The drama centers on the wealthy Carrington family and the energy empire they must defend against the Colbys and other adversaries, as well as one another. Blood is thicker than water, but whether it’s dearer than oil remains to be seen. What do you think? Which season two episodes of the Dynasty TV series do you rate as prosperous, impoverished, or somewhere between? 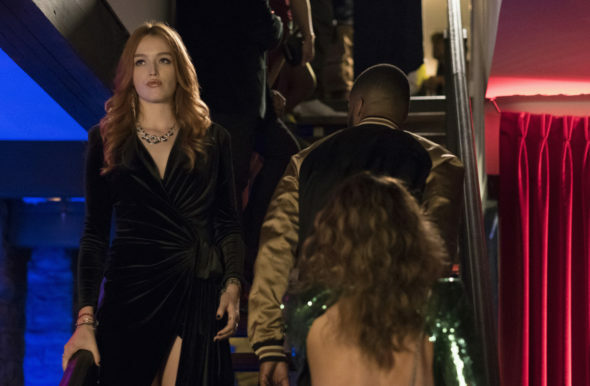 Should The CW cancel or renew Dynasty for a third season? Don’t forget to vote, and share your thoughts, below. More about: Dynasty (2017), Dynasty (2017): canceled or renewed? Oh Yes renew the third season! We love the renewed Dynasty very much❤️ Can’t wait to see more! Dynasty is real good thats my show i always records it.i use to watch the old one to i use to watch Dallas and the reboot of Dallas but they cancel i hope they would reboot falcon crest and knots landing. Please renew for season 3, love a good night time soap. You have to do a season 3 I’ve just watched all of season 2 in one day!! It can’t end like that and it’s always leaving me on my sit or my heart racing to what happens next! Theirs plenty of people watching it but just not on the days of realse doesn’t mean it needs to be cancelled I only got round to watching season 2 now due to having a baby and losing my baby and burring it plus I have an 15month old life’s busy! Don’t cancel keep it going!! So many people love the show!!! Totally nothing like the first Dynasty, but that was another time and audience. That being said, I still love it. Kinda twisted, but just enough to possibly be real. I would like it to be renewed. I do still love Blue Bloods and Last Man Standing the best though! I love the show! If the CW cancels this show I will never watch another CW program again. I finally have something juicy to watch and it’s the only program like it on TV now. Advertise it! Put on a better time! Or Night?!! Season three is a must as so entertaining, and soooooooooo good,dazzling,cool, a yes,yes, YES to watch.